Market was not quite active for GBPUSD yesterday due to the Memorial Day. Yesterday the price fell at first but soon changed its direction to upward and today it rose higher. 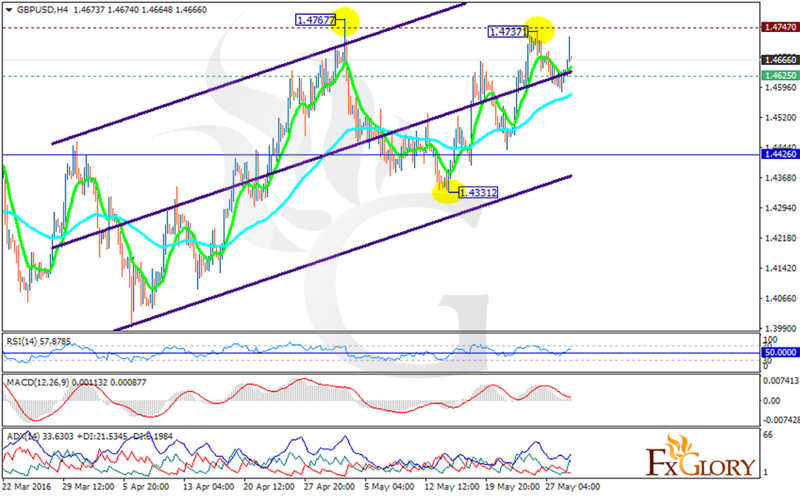 The support lies at 1.46250 with resistance at 1.47470 which both lines are above the monthly pivot point at 1.44260. The MACD indicator is in positive territory, the RSI is above the neutral zone and the ADX is showing stronger buyers than sellers. Moreover the EMA of 10 is moving above the EMA of 75 suggesting the bullish tendency of the chart in the last recent days. Long positions are recommended with the target at 1.4724.